Who’d win in a Boy Scout Handbook-inspired battle between current Scouts and adults who didn’t quite make Eagle as boys? Tonight, we finally discovered the winner — well, of Round One, at least. The season premiere of Are You Tougher Than a Boy Scout? on the National Geographic Channel was my first time seeing the show I’ve been hearing about since January 2012, so my expectations were high. Spoiler alert: This recap will include details that reveal who won the competitions in this week’s episode. Don’t read on if you haven’t seen Episode 1 and want to be surprised by the results. The show takes us to Camp Whitsett in the beautiful Sequoia National Forest. For each episode, three Scouts are chosen from a rotating cast of Scouting stars — the best of the best — to go up against three adults who were previously in Scouting and are now out to prove a thing or two. Scouts not competing in a particular episode stand on the sidelines for moral support. The episode started by introducing us to Dan, a 30-year-old telecommunications specialist looking to prove he’s just as good at outdoors skills as his two brothers who are Eagle Scouts. Dan dropped out as a Star Scout. Finally we met Mark, a 45-year-old drama teacher whose Scouting career ended when his troop folded. The adult trio quickly elected the outspoken Mark their patrol leader. Baden-Powell may not approve of a three-person patrol, but these adults didn’t have much say in the matter. Representing the Scouts in this episode were Keegan (aka “Yeti”), Michael (“Hitch”), and Rob (“Robin Hood”), three teens who came off as well-spoken and knowledgable about Scouting — no surprise they were among the Scouts chosen by producers to represent the program’s best. A three-part challenge tested the teams’ abilities in three popular merit badges: Orienteering, Climbing, and Lifesaving. Right away I noticed just how deeply it appears the merit badge program will be incorporated into the show. That’s a nice way to tell the uninitiated viewer what his or her son might get out of the program. The implication is that there’s a merit badge for just about everything — which isn’t too far from the truth. Along those lines, the show includes little educational nuggets during each challenge. Remember that show Pop Up Video on VH1? Tougher uses a similar approach, replacing random facts about a music video with tidbits ripped from the pages of the Boy Scout Handbook, such as the three stages of a canoe stroke (catch, power, recovery). The first challenge had three parts that both teams completed in a different order: a lifesaving task where one member tossed a ring onto the lake to collect floating boxes; a slingshot activity, which required a teammate to knock three cans off their stumps; and a simple rope climb up a boulder. Rob, a lifeguard, took over the lifesaving task for the Scouts. And though he lost the rope attached to the buoy once — not good when you’re in a real rescue but fine in a reality show — he got the job done quickly. Meanwhile, back at the adults, John was proving he was no Bart Simpson with a slingshot, needing every last “bullet” to finally knock off all three cans. Though they showed some frustration, the adults were generally supportive of one another during the task. But the real teamwork came from the Scouts. During Michael’s turn with the slingshot, Rob offered some worthwhile aiming tips — I guess “Robin Hood” isn’t just good with a bow and arrow. The adults advanced to the climbing wall, a task that took almost no time, thanks to Mark. Keegan scaled the wall with ease for the Scouts, helping give them a small cushion entering the pioneering finale, which tested the teams’ skills tying square lashings to build a gateway. The lead was too much for the adults to overcome, and the Scouts won the first challenge. At the adults’ campfire later, fingers were pointed. It was a grown-up version of “thorns and roses” but with few roses being tossed around. As the patrol leader, Mark took much of the blame from his teammates. But when it was time for the Scouts to pick someone to send home, they chose John, telling him, “I’m sorry, you are not tougher than a Boy Scout.” John handled the elimination well, shaking the Scouts’ hands and leaving with a positive attitude. If Michael and Keegan were the Harlem Globetrotters, adults Dan and Mark were the Washington Generals. Yes, this Canoe War wasn’t even close. Here’s how it worked: The teams of two participated in three events, each involving paddling their aluminum canoes around Lake Ida. They started with a quarter-mile race, continued with a tug of war, and finished with a canoe jousting event that surely raised the blood pressure of a few health and safety guys out there. The Scouts won the quarter-mile race with ease, and Dan even suggested to Mark near the end that they stop and conserve their energy for the next round. That might’ve been smart, because Michael and Keegan dominated the canoe tug of war, a neat event that’s exactly what you would imagine it to be. The canoes’ sterns were tied together, and the first team to drag their opponents over a predetermined line won. Finally, canoe jousting. Like the adults on the show, I had never heard of this activity before. Basically, the person in the bow trades his paddle for a padded stick and tries to knock his opponent into the water. The adults managed one knockdown, but it wasn’t enough. During their fireside chat that night, the Scouts discussed hearing Dan give up during the canoe race, and that didn’t sit well with them. Dan was eliminated. Mark, the drama teacher, stayed in the show for the third and final act. And he said he earned the Wilderness Survival merit badge when he was a Scout, making the “Toyota Wilderness Challenge” perfectly suited for him. And for me, as the viewer, because Wilderness Survival was one of my favorite merit badges from when I was a Scout. Keegan (“Yeti”) was tapped for this one, which asked participants to show off their skills in the wild without most of their gear — and, for some reason, without their shirts. Sure, wilderness survival in real life isn’t exactly a race, but it was fun to see these guys out on their own and imagine what was going through their minds as they built a lean-to, started a fire, and covered themselves with mud. Oh, and this wouldn’t be a reality show without someone eating bugs. So Keegan and Mark ate wilderness survival rations: a worm, grub, and grasshopper. The graphic helpfully told us that insects have more protein than beef. Good to know, but I’ll stick with a cheeseburger, thanks. Mark wasn’t fazed. “Just like mother used to make,” he said, downing his entire insect assortment like Pumbaa in The Lion King. Then the guys made spears out of a long piece of wood, Mark hacking at his and Keegan calmly whittling. Nicely done. But equally impressive was the fact that the first person clapping and patting Mark on the back was Keegan. A true Scout knows how to win and lose. The Scouts gave Mark a nice knife engraved with “Prepared. For Life.” Mark, a fourth-generation Scout, said he will pass on that knife to the next generation when the time comes. Quite a few of the challenges translated perfectly to a troop or crew campout. Which have you tried in your troop? Which do you think your Scouts would want to try? I think the first challenge — an orienteering course with three stations along the way, each providing puzzle pieces to bring to a big finale, would fit perfectly at a troop or district event. A group of four or five Scouts could compete against their assistant Scoutmasters in a similar course. Seems like a nice way to bring friendly competition to your guys. We didn’t really learn what would have happened if the Scouts had actually lost the first or second challenge. The Scouts don’t get sent home, I presume, so it’ll be interesting to find this out in future episodes. Gotta love the adults chanting, “Old men, old men, gonna be a Scout again” without any shame. I thought the graphics were very polished, and the imagery that was consistent with the current version of the Boy Scout Handbook was a nice touch. Note to self: Mud is the ultimate sunscreen and insect repellant. I’ll never spend money on Banana Boat and Off! again. 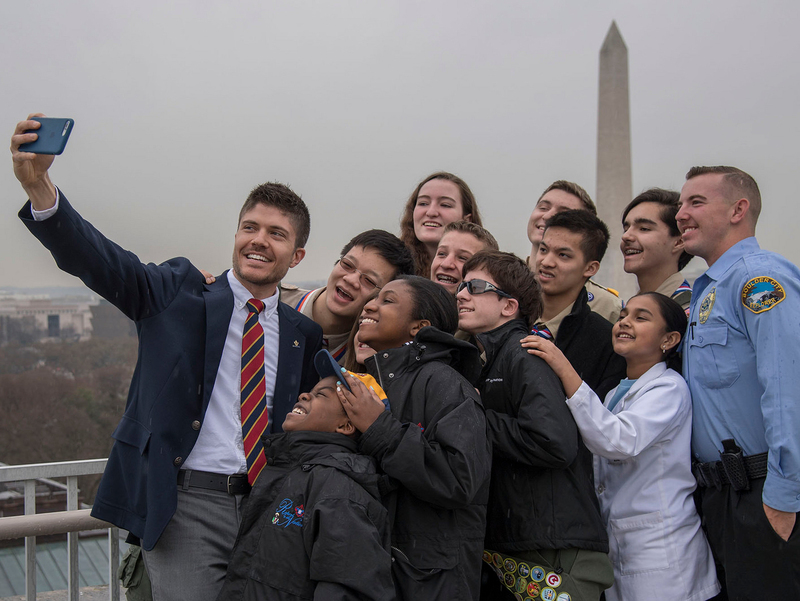 The next episode, titled “Ninja Scouts,” airs at 8 p.m./7 p.m. Central on Monday, March 11, on the National Geographic Channel. National Geographic Channel is working on a variety of options for online viewing, but none is live yet. I’ll post more information as soon as I get it.